Can I use just a primer and PCR to join the cutted plasmid like this ? without using any further enzyme like ligase. 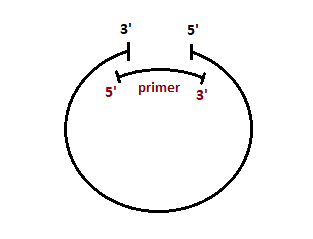 After the linear dsDNA plasmid annealed into 2 ssDNA, primer will bind to middle. And Taq Polymerase will bind to the 3' and start extend the DNA to join the plasmid. So I don't need a ligase enzyme, is that possible? Edit: I think the plasmid will be nicked at 2 position with this method but will this plasmid still work in e.coli cell? Browse other questions tagged pcr plasmids recombination or ask your own question. How do nicks in the DNA strand affect the success of Long Range PCR? Why do PCR manufacturers recommend assembling the reaction mix on ice? Can you Interrupt a promoter region by inserting another promoter region into it? When using a primer to replicate DNA in a plasmid, does it replicate the whole plasmid? Why doesn't my rtPCR reaction work?